Today we have a new construction rumor coming from one of my favorite parks, Canada's Wonderland. I make it no secret that we here at ISI fell in love with Canada's Wonderland during our review of the park early this season, if your wondering why I sincerely suggest you read the review! The News has BROKEN! We know what's going into Wonder Mountain! Check the link below! Canada's Wonderland- New Dark Ride for 2014 "Wonder Mountain's Guardian"
New 'holes' and 'patchwork' have appeared in the Mountain which is the focal point of the park. Rumors have gone wild that the park is likely building a new coaster or thrill ride which will use the mountain as a 'tunnel' ride element. According to rumors found at Screamscape, the GM of the park has gone so far as to say on twitter that "I'm sure you'll be thrilled to know why there is a hole in the mountain". Judging by this hint, we may well be looking at some form of a new roller coaster being added to the park! The downside to this rumor is that we could see the removal of Thunder Run to make room, which also uses the mountain to house it's track and ride. Canada's Wonderland last built in 2012 when they added the amazing coaster Leviathan, a B&M answer to Millennium Force. 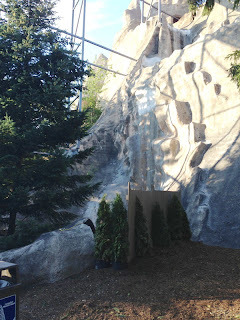 Rumors are that the 'hole' in the side of the mountain are getting larger, either to remove something (possibly Thunder Run?) or to add something in (New Ride?). Currently the park still hasn't said a word about this development although some are saying that August 30th could be when the park makes an announcement about 2014 and what may be coming/going from the park! Right now, nothing is confirmed or denied. InSanity lurks Inside will bring you more information as it becomes available!